Please note: there are several colours available in this range. Unfortunately it's not possible to request a specific one, so please let us choose one on your behalf. The Basics Bottle Brush has a dual ended design, with an extra wide end for the bottle and a smaller end for the teat. 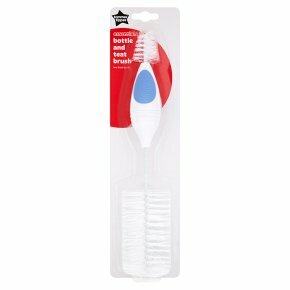 It also comes with durable nylon bristles and a non-slip handle to help make bottle cleaning easy and effective. Please read and retain this important information for future reference. Cold water sterilisation only. Not suitable for sterilisation by boiling, steam or microwave.